Psoriasis is a multigene and multifactorial skin disease with heterogeneous genetic inheritance. 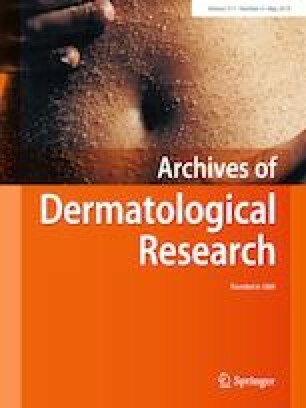 Mental disorders participate in the development of psoriasis as predisposing factors; a correlation of dermatological diseases with pathological anxiety and stress was shown. Meanwhile, there are no studies describing molecular mechanisms of the linkages between psycho-emotional disorders and skin diseases. The aim of this study is to find the associations between SNP in genes COMT (rs4680), DBH (rs141116007), CCKAR (rs1800857) and CCKBR (rs1805002), and psoriasis. Patients were selected according to the 10th revision of International Classification of Diseases (L-40). The sample size was 88 patients. The size of the control sample (population control) was 365 people. Genotyping was performed using PCR-RFLP and real-time PCR. Statistical analysis was performed using WinPepi software. Identification of complex genotypes was performed by the Monte Carlo method using APSampler 3.6.1 algorithm. Among the studied genes, only GA genotype of COMT gene is significantly associated with psoriasis [χ2 = 19.163 (p = 1.3E−5), F (p) = 1.2E−5, OR 3.47 (CI 99% = 1.61–7.91)]. At the moment, the functional significance of this phenomenon is difficult to explain. We would like to thank all patients for their participation in this study. We would also like to thank Ekaterina Gapanovich, Liubov Korobeynikova and Alena Malakhova for helping us provide molecular genetic analysis. This research received no specific Grant from any funding agency in the public, commercial, or not-for-profit sectors.